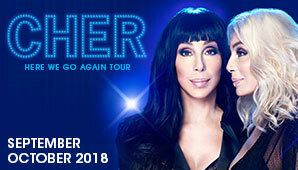 See Cher’s farewell to Sydney show! The American icon announces a performance at Kudos Bank Arena. Touching down in Australia this month, the global superstar will bring her spectacular Here We Go Again! Buoyed by the amazing response to her March visit to celebrate the 40th Sydney Gay and Lesbian Mardi Gras Cher is returning Down Under after a 13 year absence. Expanding on her ecstatically-received appearance and show-stopping 20-minute set at this year’s Mardi Gras and Party, fans can expect to be dazzled by Cher’s renowned lavish and flamboyant costumes and elaborate stage production, while revelling in a more than 90-minute performance of hits and classics such as: “Believe”, “If I Could Turn Back Time”, “Strong Enough”, “I Found Someone”, “Gypsys, Tramps & Thieves”, as well as going all the way back to where it began, with “I Got You Babe”. Opening all shows on the tour will be party DJ, Andrew McClelland.